Every child has heard the healthy-eating mantra “You are what you eat.” But there may be a closer resemblance between good-for-you grub and your body than you thought. We found 10 foods that mirror the body parts they provide nutrients for—for example, brain-boosting walnuts actually look like a brain. Coincidence? Maybe. Though these healthy foods are beneficial to the whole body, the list below is a fun reminder of what to eat to target specific areas. Reposted from Wellstyles Monthly Newsletter, a Regular Service of Valley Schools Employee Benefits Trust (VSEBT). Originally published by http://www.health.gov. 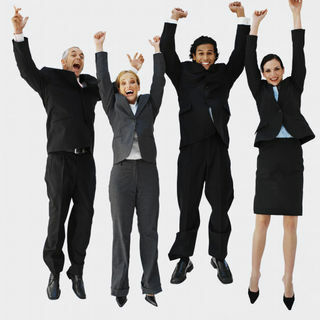 Healthy workers are also happy and productive. Encouraging your workers to work out works! Home Depot employees who participated in a companysponsored program to support workers in setting exercise goals notably increased their levels of moderate or vigorous physical activity. For 3 months, 1,442 participants set weekly personal and team physical activity goals and reaped incentives for meeting them. After 6 weeks, slightly more than half of the participants did at least five 30-minute moderate exercise sessions or two 20-minute vigorous exercise sessions weekly—up from about 30% at the study’s start. Meanwhile, only 25% of those in a control group of nonparticipants logged similar exercise sessions. Throughout the study, the participants maintained their increased levels of activity, and few people dropped out. “The biggest pleasant surprise was the steady and sustained progress. That can probably be explained by the social incentives and support from personal goals and achievements that had direct impact on team success,” says study lead author Rod Dishman. Key to the program’s success may have been the use of group and organizational goal-setting along with individual goals, because they provide vital peer encouragement, says Katherine Alaimo, a professor at the University of Georgia. “Personal and team goals work best when they are self-set, specific about how much activity and when, realistic but attainable and easily assessed, such as by weekly logs or pedometer steps,” says Dishman. Although you can’t change your genes, there are plenty of home remedies to combat oily skin using kitchen ingredients. Almonds and honey. The luscious combination of succulent almonds and sweet honey works well as a gentle facial scrub for removing oils and dead skin cells. Mix a small amount of ground almonds with honey to make a paste. Gently massage the paste into your skin with a comfortably hot washcloth. Rinse with cool water. Baking soda. Be abrasive, but in a mild way. Liquid soap users can add 1/2 teaspoon baking soda into the mixture. Rub gently onto oily areas such as the nose and chin. This gentle abrasive works well in getting rid of blackheads as well as oil. Rinse with cool water. Vinegar. A good way to exfoliate the skin is with white or apple cider vinegar. Apply using a cotton ball before bedtime. Leave it on for five to ten minutes and then rinse with cool water. You’ll need to use this remedy for three weeks to see improvements. If your skin is super-sensitive, dilute the vinegar with four parts water. For a summertime treat, chill the vinegar or freeze it into ice cubes and apply as a cooling facial. Apples. If you’re willing to do some creative cooking, your effort will be rewarded with this homemade, oil-ridding facial. Mix 1/2 cup mashed apple, 1/2 cup cooked oatmeal, 1 slightly beaten egg white, and 1 tablespoon lemon juice into a smooth paste. Apply to your face for 15 minutes, then rinse with cool water. Egg yolk. A fast fix for removing oil shine requires one of the simplest foods: the egg. An egg yolk mask dries out the skin. Apply the egg yolk with a cotton ball to oily spots. Leave on for 15 minutes, then rinse with cool water. Lemons. Mix equal parts lemon juice and water, pat on face, and let dry. Rinse first with warm water followed by cool water for a refreshing treat. Limes and cucumbers. Citrus fruits and some vegetables not only refresh the skin but also help reduce oils. Try mixing 1/2 teaspoon lime juice with an equal amount of cucumber juice. Apply to skin a few minutes before showering. Learn home remedies for oily hair when you visit our Home Remedies for Oily Hair page. To get tips on how to tame dry hair, read Home Remedies for Dry Hair. Read our Home Remedies for Dry Skin page for great home remedies and tips on how to moisturize. Timothy Gower is a freelance writer and editor whose work has appeared in many publications, includingReader’s Digest, Prevention, Men’s Health, Better Homes and Gardens, The New York Times, and The Los Angeles Times. The author of four books, Gower is also a contributing editor for Health magazine. Alice Lesch Kelly is a health writer based in Boston. Her work has been published in magazines such asShape, Fit Pregnancy, Woman’s Day, Reader’s Digest, Eating Well, and Health. She is the co-author of three books on women’s health. Michele Price Mann is a freelance writer who has written for such publications as Weight Watchers andSouthern Living magazines. Formerly assistant health and fitness editor at Cooking Light magazine, her professional passion is learning and writing about health. David J. Hufford, Ph.D., is university professor and chair of the Medical Humanities Department at PennsylvaniaState University’s College of Medicine. He also is a professor in the departments of Neural and Behavioral Sciences and Family and Community Medicine. Dr. Hufford serves on the editorial boards of several journals, including Alternative Therapies in Health & Medicine and Explore. This information is solely for informational purposes. IT IS NOT INTENDED TO PROVIDE MEDICAL ADVICE. Neither the Editors of Consumer Guide (R), Publications International, Ltd., the author nor publisher take responsibility for any possible consequences from any treatment, procedure, exercise, dietary modification, action or application of medication which results from reading or following the information contained in this information. The publication of this information does not constitute the practice of medicine, and this information does not replace the advice of your physician or other health care provider. Before undertaking any course of treatment, the reader must seek the advice of their physician or other health care provider. 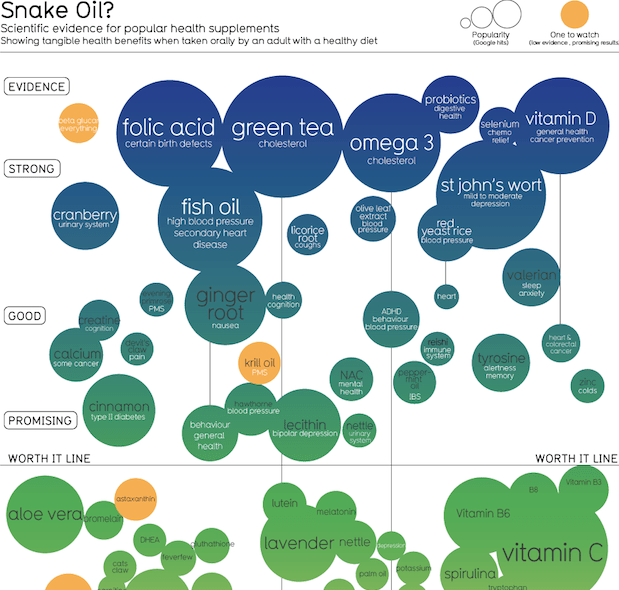 Infographic of the Day: What Health Supplements Are B.S.? The scientific consensus on everything from vitamin C to ginko biloba. We’re drowning in neutraceuticals, which are unregulated and often make ridiculous health claims–which is probably the key reason why they’ve become a $23 billion industry. The bubbles show a given supplement, and the health benefit in confers. The higher the bubble on the chart, the more evidence there is for its effectiveness. Some supplements appear more than once–for example, omega 3–because they might have multiple effects. And each of those has varying amounts of scientific back-up. See the full-size still image here, and the interactive version here. 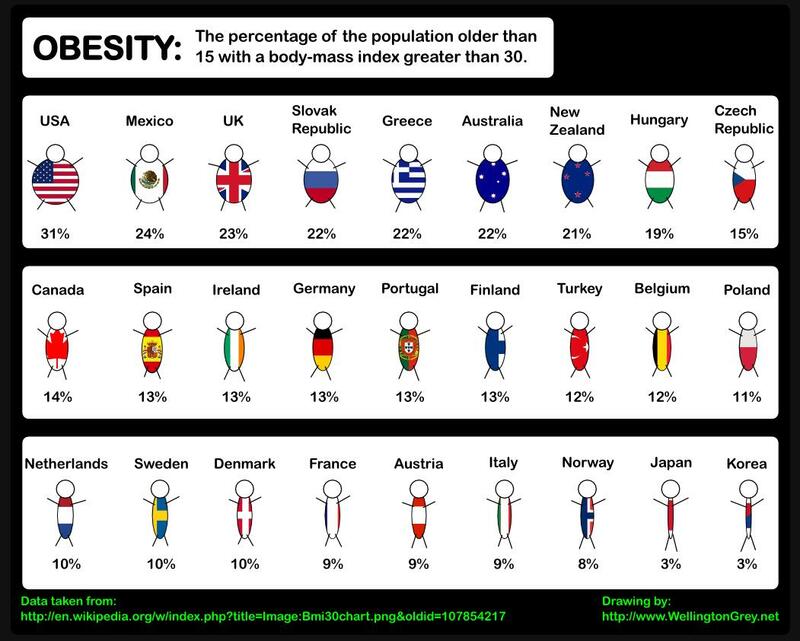 A chart showing obesity rates. The one for Korea must be South Korea. I think North Korea has starved its people enough that it should appear as a negative number, those under weight.